A winding and sometimes confusing drive ended in the late afternoon when we arrived in Wadi Musa, the town whose starring attraction, the ancient Nabatean city of Petra, draws day-trippers from Israel and Egypt in addition to those traveling through Jordan. 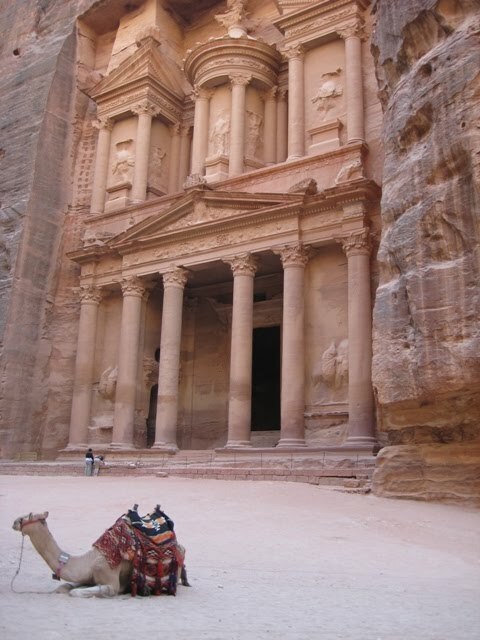 If you have seen Indiana Jones and the Last Crusade, you might recognize the Petra Treasury building as the location of the Holy Grail. Juli and I netflixed it just before we left...sadly it is a very poorly acted movie, which thankfully we had never noticed as kids. A few times a week Petra is opened for a special night visit, and the evening we arrived it was going on so we joined in. To get to Petra there is a 2.5km walk from Wadi Musa through a narrow canyon called the Siq, which for the evening visit is lined with candles. As it was our first walk down the Siq, the anticipation builds quite nicely until right between two sheer rock faces you catch your first glimpse of the Treasury, also candle-lit for the evening. It seems so out of place and so 'modern' even though it was 'built' (carved into the wall of the canyon) in the 6th century. Once all 200-odd visitors arrive and are seated, cue the Beduoin music and tea, and you have your evening. Fortunately I was equipped with my gorrillapod and camera, and was able to snap a cool night shot of the candle-lit building...but posting it will have to wait (sorry). Our daytime visit to Petra started early the next morning and lasted until we just could not walk any more. From about 7Am to 4PM, we traipsed around the ancient city, up giant sets of staircases and across boulders, to checkout all the tombs that had been carved into the canyon walls (the Nabateans actually lived in tents much like the Beduoin). We made an early morning ascent to the 'High Place of Sacrifice' which made for some great views. Then in the afternoon we did another similar climb to a tomb called 'The Monastery.' The two climbs combined for over 1,700 steps. The whole experience was very reminiscent of our visit to Machu Picchu - the day starts off with just a few die-hards walking around, then builds as more tour buses roll in, all the while you take in some amazing views and marvel at the architecture that had been created so long ago. And because the scale of the place is massive, you keep on walking until you just can't walk any more. All in all it is an amazing site and a day well-spent, though the heat certainly doesn't help. In the evening we were fortunate enough to arrange to participate in a cooking class at a local restuarant. We made some baba ganoush, tabbouleh, thyme/cheese pastries, and a main of chicken and rice among other items. We had a small issue when I told the head chef that the chicken and rice was too salty, owing to the four or five giant scoops of salt he threw in - but he insisted it was the tomato paste. We agreed to disagree (in fact other members of his staff and our table agreed), but nonetheless he didn't like me much after that. So we're bringing home some recipes and hopefully we will put them to good use at home! It is so cool to see you and Juli having so much fun on your vacation! Too much salt...well of yeah...I see a CANISTER of salt, not a salt shaker!!! Your proof is in the pic:). I just bought a gorillapod. Awesome. Thanks Tommy. 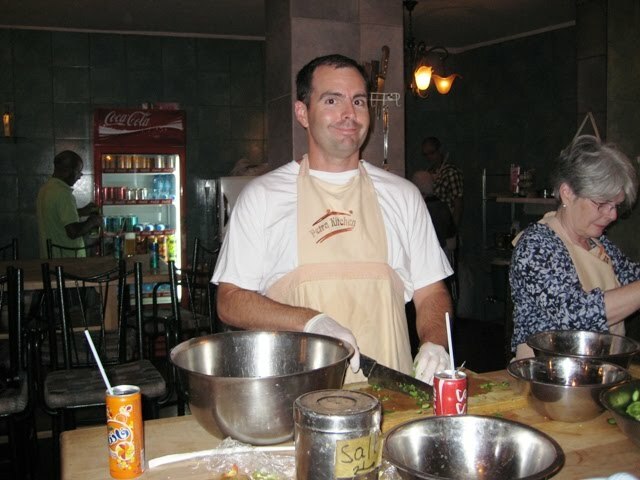 @Grace - yes that was the canister the chef quite liberally scooped out of, laughing as he did with while even then I started at him with a look saying "that is way too much salt"
@Nextian - darn should have setup an affiliate link and made 5 cents from your purchase! Cooking class?! Be still my beating heart. Looks fun.